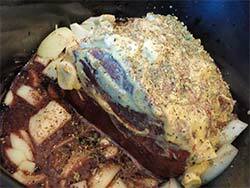 You Will Love This Moose Roast Recipe! Company for dinner tonight? 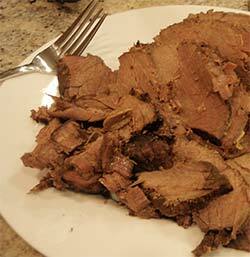 This slow cooker moose roast recipe is one I highly recommend. We used a boneless cross rib roast from the moose we harvested this year for this recipe (this cut is also known as a boneless shoulder pot roast). This cut comes from the animal just below the chuck and above the brisket. You must cook this roast in liquid to prevent it from becoming tough and stringy. Someone once asked if serving Yorkshire Pudding would be appropriate with this type of wild meat. Absolutely it would, as a matter fact this is exactly what we have in mind. Moose cross rib roast, served with mashed potatoes, vegetables and Yorkshire pudding with gravy of course. A little Yellowtail Shiraz to wash it down, Yum! 6 cloves garlic - peel garlic cloves and coarse chop. Remove silver skin from roast, this usually involves cutting the butcher twine and retying. Scatter onions and garlic onto roast. Cook your roast covered for about 4 hours on high or 7 hours on low until you reach your required doneness. When done remove from slowcooker, let stand for 5-10 minute before cutting. If you don't do this all the juice will run out of the meat. Make your gravy from the remaining broth in the slow cooker. 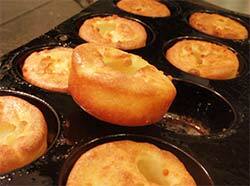 Served with Mashed potatoes, Vegetables, Yorkshire pudding and Gravy. As with most wild game meats, don't overcook! Because wild meat is very lean, if or should I say when you overcook the process removes the moisture and burns off the little fat there is. In doing so the meat becomes tough.